Why body weight can affect more than just your health. You know that being overweight or obese can increase your risk of type 2 diabetes, cardiovascular diseases, and even cancer. But did you know that body weight can also take a toll on both psychological and social health? New research from the University of Michigan examined the individual social, financial, and emotional consequences of being overweight in one of the first long-term studies in this area. The researchers followed 5,000 high school seniors until middle age, tracking their body weight and body mass index (BMI) annually for 22 years. The researchers identified two distinct paths for body weight: people who were of normal weight in high school and gained small amounts of weight each year for the next 15 to 20 years, and those who were overweight at age 19 and continued to gain more rapidly during the study. 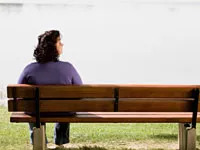 While the study does not suggest that being overweight or obese cause a person to be single or lonely, it is well-known that body weight status can wreck one’s self-esteem, which makes it harder to excel in school, work, and relationships. The study shines light on the overlooked factors associated with being chronically overweight, and it highlights the importance of helping young adults manage their weight, rather than allowing weight problems to determine their fate in life. To develop healthy eating habits and learn how to teach children to choose wholesome foods, check our family nutrition section.